I love the truth that JOY isn't some sort of fluffy, silly emotion. On the contrary, God's kind of joy is a powerful thing, a force to be reckoned with. It's an immovable stronghold, impenetrable to the storms of life or the attacks of the enemy. The joy that God gives isn't dependent on things all going my way or life being a bed of roses. It's an effervescent fountain from a supernatural source in the middle of the desert. It can't be manufactured, bought, or produced by human effort. It's the sap of heaven flowing in my soul when I'm connected to the Vine, Christ Jesus. Without Jesus I am weak and puny and easily shaken. I can't even stand on my own two feet in the face of life's turmoil. But, like tea put in hot water infuses that water until it becomes a whole different thing, tea, Jesus in me makes me a whole different me! I am filled with His joy and infused with His strength. I can face the unknown future with confidence, with boldness, with JOY! here and with the lovely Lisha Epperson. Thanks, my friend. I'm so proud of the way you got though a really difficult and scary season! I love you much. I think I shall print this and hang it as a daily reminder because this my friend says it so well. I'm so grateful we share the same word this year. I am so grateful you wrote THIS. Beautiful. Beth, what a blessing for you to let me know that this post blessed you. Thank God that He can use even me! Isn't that an amazing thing! Joining you from (in)courage as a fellow (in)courage community group co-leader. Your lovely photo on this post drew me in and your words did not disappoint. I too am so very thankful to be infused with the Lord's joy - the powerful kind - because I'm a weak-kneed, puny, and weak-willed mess without my Savior. I'm so blessed that you came by and took time to comment! Love this and the verses--the JOY of the Lord is definitely my strength. You just did beautiful job of explaining what true joy is! The Lord is definitely my strength and I'm learning more over the years how He is the one source of true joy and my strength. He has kept me going through lives most difficult trials! Elizabeth, I have so enjoyed your comments on my blog lately. You daughter and her family are so inspiring to me! I love hearing testimonies of others living out God's plan for their life-- He has such good things for us! You are a blessing, Leslie! Thank you for your kind encouragement. This is just beautiful. I am so grateful that He pours His strength into this weak & puny vessel. What a good word! Blessings! Thanks so much for your encouraging comment! Your visits here always bless me. Elizabeth, this is beautiful. The perfect way to start my morning with a cup of coffee in hand. 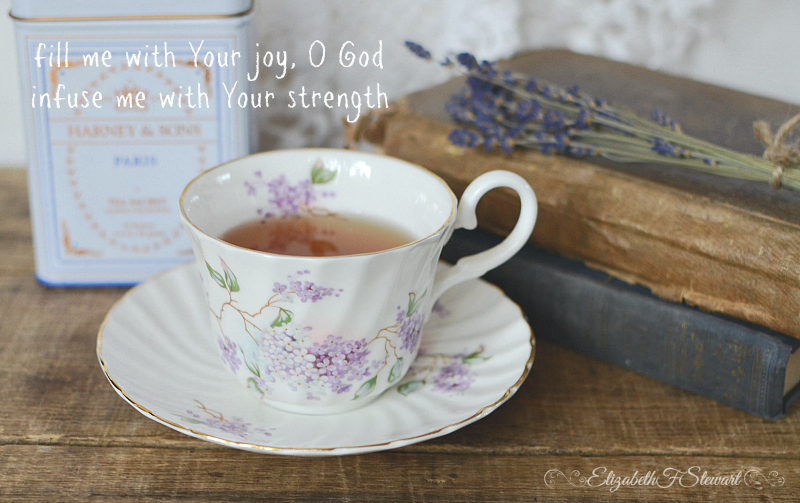 I love the idea of joy infusing our lives through Christ. A very serene imagery that just brings peace. When I first read Philippians 4:13 in the Amplified Bible and saw that Jesus infuses us with His strength it impacted me in a way that I've never forgotten! I love that thought...infused with strength and filled with joy. What do people do without Him? I think this thought will follow me each time I make my morning tea! Pamela, I appreciate your kind encouragement on my blog post! Like Pamela, I love the thought "infused with strength and filled with joy." This has been a season of trials in our home, and without the infusion of His strength and love into our lives, I don't know where we'd be. Thankfully, we are here and healthy and following Him. I'm so glad that you are experiencing God's strength during this difficult time. I pray for God to continue His good work in and through you! Beautiful! Thanks for sharing this inspiring post & graphic & for visiting me at Doorkeeper. Blessings! Thanks so much, Renee, for coming by! Karen, I'm so glad you came by and I sure appreciate your kind comment! When I read in the Amplified Bible that God infuses me with His strength it impacted me greatly! You and I sure go the same direction so often. You are a real treat... to me and others around the world. Thank you. A heart grabber again. Beautifully shared and a lovely image! Yes! To Jesus making me a whole new me. Love the analogy of a tea bag in hot water. My night time indulgence will taste all the more sweet because of your words today, thanks Elizabeth! Love this, so much, my friend! A lovely cuppa, Elizabeth! and just the encouragement I needed today - thank you, friend. Hi Elizabeth! I was led over here by Beth, it's good to see you again!